So, like many women, I have a love/hate relationship with shaving. It's a hassle, it's expensive, but in the spring and summer, it's necessary. I know some friends who wax, but I just can't try that. I can barely manage to get my eyebrows done, I can't imagine doing anything more. And forget about chemical treatments like Nair - I tried that once in my teens, and my legs stung for hours afterwards. Maybe I'm just sensitive, but I never had the desire to repeat the experience. I have watched my husband's shaving routine over the years, and marveled that no one seems to market the same concepts to women. There are far more electric razor options for men, for example. I've done disposable razors, I've tried electric, and they all have their drawbacks. Disposables are expensive, clog easily, and for those who are conscious of such things, are just one more thing to add to the landfills. Electric only work when they're charged, don't offer as smooth or as close a shave, and for me at least, tended to need replacement every few years. 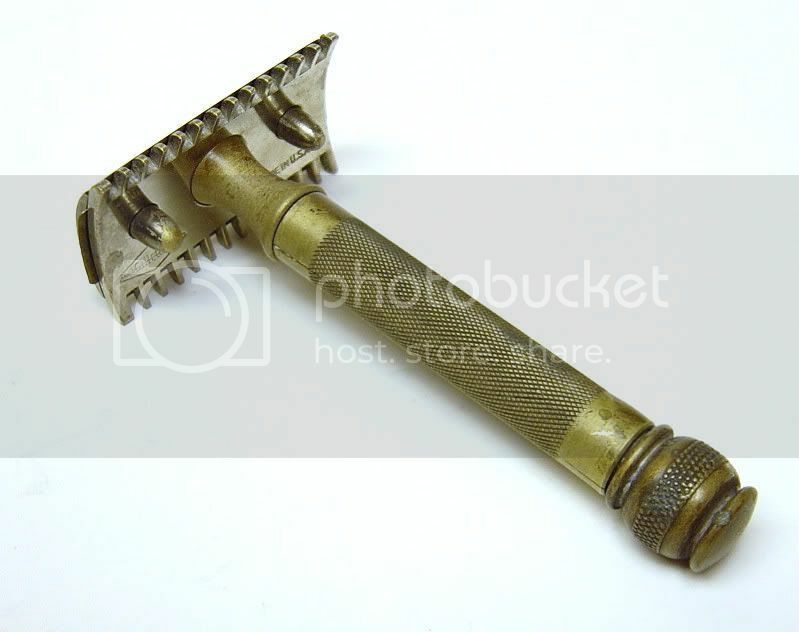 It's a Gillette from the 1920's. The double eded blade fits between two plates that form the head of the razor. We also purchased a badger hair brush and classic shaving soap on Amazon for around $30 together, and he watched a bunch of youtube videos and away he went. There was a learning curve - you can't use pressure with these, or you will find yourself nicked. You have to just let the blade glide over your skin on its own. The shave was a lot closer and smoother than he had experienced before. After several months of this, he has now moved one step further into straight razor shaving, something we seem to only see these days in movies. I can remember (vaguely) my father shaving this way when I was young, but he eventually moved to disposable razors. Last week, I ran out of disposable cartridges, and my electric razor was uncharged, but I needed my legs shaved. It was hot out, and I wanted to wear my capris for the first time this season. Thinking to myself "Well, it works for him..." I grabbed the safety razor you see pictured above, popped a new blade into it, and borrowed my husband's brush and soap. I proceeded to shave my legs, with a little fear of what might happen. To my surprise, it was easy. My fear probably helped, because I was so light and careful with the razor, I was using no pressure at all, just enough contact to draw it up my leg. ~ As with all shaving, the soap definitely helped. The blade did not glide easily if the soap was not present. ~ ZERO clogging! After a few passes, I was wondering if it was working at all, the blade was so clean and clear. Then I saw all of the hair in the bath water. ~ Smoooooooooth! This was a close shave, achieved after a winter of no shaving, in only a handful of passes. It would have taken me forever with a disposable blade to get the same result. ~ I did not cut or nick myself even once!! ~ This was seriously so similar to using a disposable razor, other than the technique of not using pressure, and finding the right angle, which was actually pretty darn easy, that I have to wonder WHY we switched to the evil disposables in the first place? My guess is, because it was a way for the manufacturers to get more money out of us by marketing the "convenience" that honestly isn't all that convenient. ~ There are a few other things needed. For example, the blade really does matter. I know this from my husband's experimentation. He prefers Feather blades, known as the sharpest out there, and I must say they did great for me. They aren't the cheapest double blades out there, but you do get what you pay for, and at approximately $0.50 per blade, compared to the $2.50-3.50 per blade refill for the average disposable razor, you are still saving significantly. ~ Again, you don't have to use a badger hair brush to apply the soap, but it does help to lather it. I like it. $13 on Amazon. Total investment: about $60, and really you could get away with just the razor and blades if you wanted to hold off on the rest of it for a bit, so about a $20 minimum. Not any more than a cheap plastic razor and pack of cartridges. But let's say you decide to go with the whole shebang. Considering a 4 pack of cartridge refills averages $20 in the store, or $15 on Amazon, this will cost you the equivalent of three or four cartridge purchases, after which your blades and soap will be astronomically cheaper than gel and refills are. I have now shaved with the L6 razor I linked above, and it feels more forgiving than the vintage razor I pictured. I loved it. No nicks, no cuts, smooooooth legs, and I love the fact that the metal blades are biodegradable and tiny compared to previous shaving waste. I highly recommend trying this classic method to any woman frustrated with shaving. Awesome! After the initial expense, it really is. And like you, I love knowing it's good for the environment, too. Let me know how it works out for you. I've also just received a bunch of recommendations for more "feminine scented" shaving soaps, so I can pass that info along if you get into this. There's even a woman who apparently clones the scents of popular perfumes in her soaps. I'm pretty sure you can "sharpen" the blades, too, by running them on jeans or something. Google has the info. Can make them last for months at a time. Thanks! I looked this up, because it does sound rather curious. Turns out, it's a topic that's been discussed quite a bit on the shaving forums, and general consensus is that "jean stropping" does not actually sharpen, but actually dries all moisture from the blade after use, which helps prevent corrosion and extends the life. A dip in rubbing alcohol would apparently accomplish the same thing. A lot of the guys use blades that cost around $0.10/apiece, so feel no real need to extend the life, and if they prefer to spend a little more for something like a Feather, they want the blade as sharp as possible anyway.